Vitality refers to the experience of having energy available to one’s self. Vital employees are full of positive energy when they work, and feel mentally and physically strong. Such employees often show higher job performance and lower stress than their less vital colleagues. Despite the importance of vitality, few public administration studies have studied vitality. More generally, by focusing on vitality, we aim to bring a “positive psychology” perspective into the domain of public administration. We analyze whether two important job characteristics (leader’s task communication and job autonomy) affect vitality. We use a multi-method design. 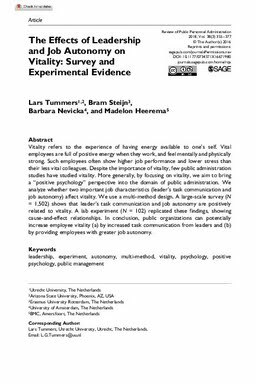 A large-scale survey (N= 1,502) shows that leader’s task communication and job autonomy are positively related to vitality. A lab experiment (N = 102) replicated these findings, showing cause-and-effect relationships. In conclusion, public organizations can potentially increase employee vitality (a) by increased task communication from leaders and (b) by providing employees with greater job autonomy.